Wij beschikken over een prachtige gite bestaande uit een recent gebouwd drie verdiepingen tellende toren grenzend aan onze omgebouwde schuur. Er is een kleine prive patio naast de toren en het gebruik van ons zonne-energie verwarmd zwembad en tuinhuis. Er is een eigen parkeerplaats in de richting van de achterzijde van het pand, zodat alle gasten hebben een eigen ingang. Er is een hydro-douche ruimte grenzend aan de lounge en functies wc en wastafel gesitueerd. Er is een reiswieg beschikbaar evenals auto-en stoelverhogers, kinderstoel en babybadje. We hebben ook twee slaapkamers te vinden naar de achterzijde van onze woning, die worden gebruikt voor de bed en breakfast, maar deze gasten hebben een eigen patio. Er is een zwembad beschikbaar dat is zonne-energie verwarmd en beschikbaar voor alle gasten. Er zijn twee mountainbikes te huur tegen een tarief van € 3 per stuk per dag. Gite très confortable, dans un bel endroit. Hôtes très accueillants. Lovely relaxing stay in a beautifully equipped Tower! We had a lovely week at this amazing quirky accommodation. Ground floor, fully equipped kitchen with everything you need. First floor, lounge and modern shower room. Top floor, large bedroom with a very comfortable bed. Amazing views over the surrounding countryside. We visited the caves at Padirac and the village at Rocamadour which was a great day out. Did the velorail bike ride at Confolens which was great, easier on the way back thankfully. St Junien is a lovely town with plenty of great places to eat and Rochechouart the next village down which is lovely, nice Chateau and had a fantastic meal at the Hotel de France. All in all a lovely relaxing week in a lovely property in a great area. Thouroughly enjoyed our relaxing stay in the tower with everything you need, a home from home. Beautiful interior with lots of quirky furnishings. Lots of local woodland walks and short drives to local places of interest/ villages. Theresa, Andrew, Millie and filou were all very welcoming and friendly. Would definitely recommend if you’re after a relaxing retreat. Booked as a surprise for the other half’s 50th Birthday- wanted something a little different. The Tower is that. Spacious living inside, with a smal terraced area to eat in too. 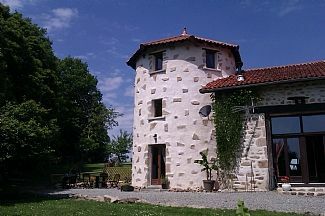 The setting on the whole is considerately planted to give privacy to the owners, gite & B&B guests. Hosts are professional & work the B&B arrivals & departures discretely alongside the longer let of the Tower. Daily visits from Millie Dog made our day, friendly pup! And we also saw lots of the cat, can’t recall his name, he came when we called him Chappy though! On the whole, a great base for siteseeing or relaxing by the pool- we did both. If you need advice on where to go, Theresa & Andrew are more than willing to provide helpful info for you. We're both really pleased that you both enjoyed your stay in the Tower and we think that Millie and Filou are missing you both. Thank you for leaving the Tower so clean and tidy and if ever you would like to come back, it would be good to see you. Property was fabulous had everything I needed for a great stay. Lovely peaceful location and property really finished to a high and characterful condition. It was a real bonus having a large screen tv showing English programs, as I was house hunting during the day and needed to relax in the evening. Theresa and Andrew were great hosts and very friendly and helpful but let you get on with your holiday without overdoing it. Overall would recommend this fab place to anyone, if I had one tiny criticism, the walk from where you park your car, to the gite is across grass and it rained a lot while I was there so this got a bit muddy and slippery underfoot, it could have done with a bit of a gravel pathway. However this did not detract from a great place. It was great to meet you and we are pleased that you enjoyed your stay in The Tower and thank you for leaving it so clean and tidy. Hope all goes well with your French property purchase and we appreciate your comment concerning the walk from the carpark when we have had a lot of rain, although normally this time of year would be sunny and not so wet, it was very bizarre. A real joy ! "La Grange Ancienne" is set in lovely quiet ,tranquil gardens. The accommodation is bright, clean and full of "quirky" touches which bring a warm and friendly feeling to the whole holiday. We loved it and felt at home from day one. Everything was immaculately presented and well equipped. a constant supply of information and help when asked. We would definitely recommend this to others, and hope to return again....soon! Hello Peter & Ruth, It was a pleasure to meet you both and we are so pleased that you enjoyed your stay with us. You are very much welcome back whenever you would like and thank you very much for keeping The Tower so clean and tidy. Booking Notes: A deposit will be required to secure your booking of 50% of total cost as well as £125 refundable deposit. Full payment of booking will be due 2 weeks prior to commencement date. Payment to be made by bank transfer to UK bank account or French bank account. Refundable deposit will be returned upon departure provided there are no deductions for damages/breakages, this can be refunded either by bank transfer (within 14 days) or a UK cheque on departure, whichever you prefer. Changeover Day: Check-in times are from 4.00pm and all clients must check out no later than midday on day of departure. Generally reservations are made from Saturday to Saturday, but please make enquiries as we can be flexible depending on bookings. Notes on prices: Our minimum stay is for 7 nights (Saturday to Saturday). However, if you do wish to arrive a day earlier (for example) we can accommodate you in one of our bed and breakfast rooms depending on availability.